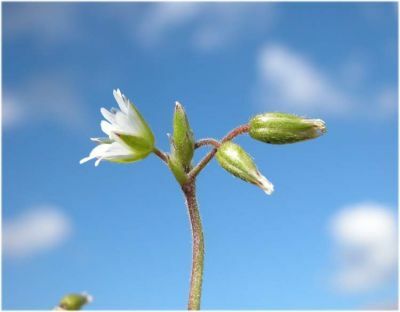 Cerastium viscosum is an annual or winter annual herb, 5-30 cm tall, sticky-hairy. Leaves opposite, stalkless, blade 1-2.5 long, 0.5-1.5 cm wide, hairy on both sides, egg-shaped, lower leaves spatula-shaped, tips rounded. 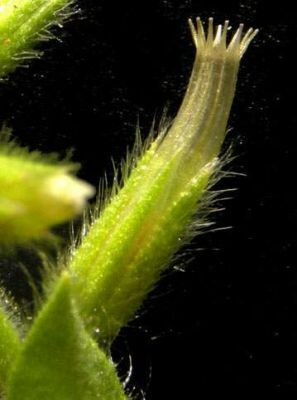 Cerastium glomeratum flower with sepals. Dipartimento di Scienze della Vita, Università di Trieste – Progetto Dryades – Picture by Andrea Moro. Creative Commons Attribution Non Commercial Share-Alike 3.0 License. luirig.altervista.org (Accessed 12/2017). Flowers white, petals deeply notched at tip, slightly shorter than to about as long as sepals, sepals to 0.5 cm, narrow, tip pointed, margins rather membranous, hairs pointing forward and extending well beyond tip, stamens 10, flower stalks shorter than sepals, bracts below flowers leaf-like, hairy; inflorescence at first dense, head-like, becoming more open, branched, but flowers in dense clusters at ends of stems; blooming April -July. Cerastium glomeratum fruit. Photo by Alessandro Alessandrini. luirig.altervista.org (Accessed 12/2017). Fruit dry, a capsule to 0.8 cm long, 0.2 cm wide. Opening at top. 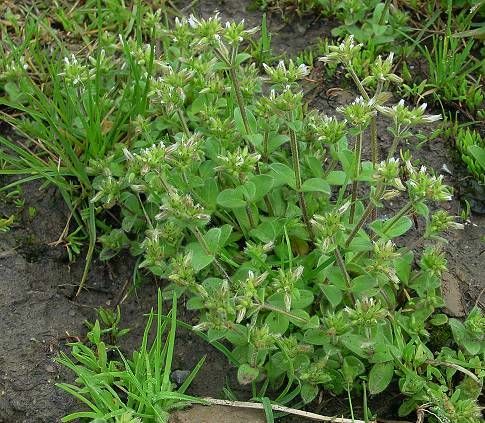 Habitat: Weed of gardens, lawns, roadsides.